Another year has come and gone, and with it, some truly remarkable whiskeys. Going into 2018 I had high hopes for Wild Turkey. Not only were those hopes exceeded, but in so many ways they arrived with a personal touch (happy 101 Jimmy & Eddie). To say that this year was rewarding as a Wild Turkey enthusiast would be an understatement. This year was phenomenal. Now it’s time to showcase a handful of noteworthy whiskeys that made it so. This is 2018’s The Best of Wild Turkey. As with last year’s Best of 2017, the premise is the same: recognize Wild Turkey releases that aren’t just quality pours, but offer traits one could argue as unique or special. Ratings will of course factor into the selection process, but it’s important to note they won’t be the sole determining factor. Produced at Wild Turkey Distillery and bottled and/or initially available for sale within the same calendar year. That means no dusties or bottles from previous years. Private single barrels, independent bottlings, even Campari Whiskey Baron releases (so long as they’re confirmed as Wild Turkey distilled and aged) are all potential selections. While some whiskeys are eligible for multiple categories, each category will have a single unique winner. In other words, you won’t find a particular whiskey winning multiple categories. That pretty much covers it. And now I proudly present for your consideration, Rare Bird 101’s The Best of Wild Turkey 2018. Enjoy! Spring of 2018 saw the arrival of the “Lincoln Town Car of Bourbon,” Wild Turkey Longbranch. Yes, the company’s famous Creative Director finally had an alright (alright, alright) bottle of his own – a unique combination of 8-year KSBW and Texas mesquite filtration. While I didn’t find Longbranch all that appealing as an enthusiast’s neat sipper, I did find that it outperformed several notable whiskeys in its weight class, specifically Jack Daniel’s Gentleman Jack and Jim Beam’s Basil Hayden’s. Its design, however, established a new standard for celebrity whiskey expressions. 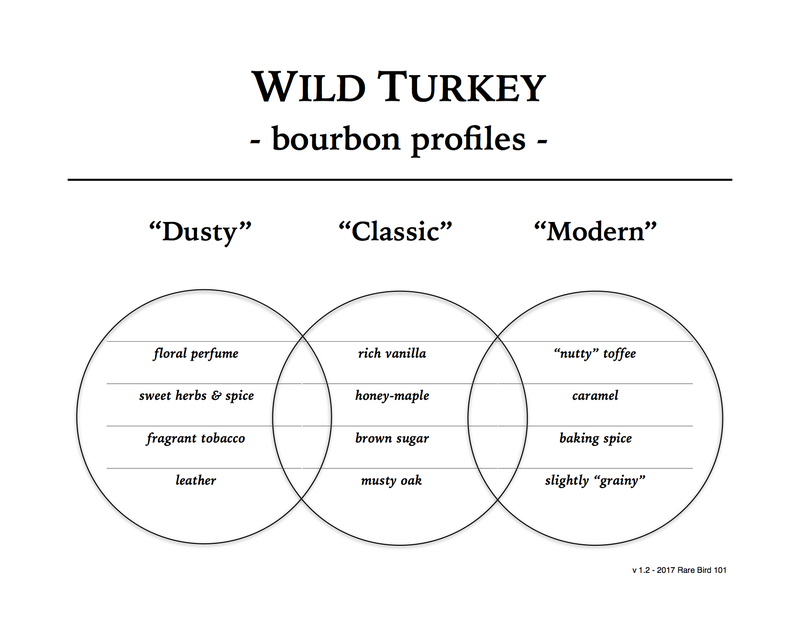 Truth be told, Longbranch’s glass bottle was originally intended as a Wild Turkey Kentucky Spirit redesign (this 2016 TTB filing helps to illustrate). But when you have an A-list creative director, you need an A-grade bottle for his whiskey. The intended Kentucky Spirit redesign took a back seat to Longbranch, and it only made sense. It’s hefty like Texas, yet simplistic and graceful in its display of Kentucky’s finest within. With antique styled embossing, classy minimalist labeling, and a solid-wood stopper with the girth and feel of a small oak branch, Longbranch looks undeniably handsome on any whiskey shelf. If only we could have the same for Kentucky Spirit’s redesign. How about it, Campari? Old Faithful, “The Daily,” the Kickin’ Chicken, yes I’m talking about the stalwart everyman’s pour, Wild Turkey 101. You might be asking, why 101 for Best Core Expression of 2018? After all, I’ve yet to formally review a 2018 bottle this year. True – but – that doesn’t mean I haven’t been sipping them! At this point I’ve tasted enough bottles to know that when it comes to Wild Turkey 101, all batches aren’t created equal. Without doubt modern 101 is consistently good, but find yourself the right bottle and you’ll be rewarded with a strikingly flavorful and balanced pour (all for less than $25). 2018 was arguably the year for Russell’s Reserve Single Barrel private selections. It all started with Lexington Bourbon Society’s “Final Pour.” But while that release set a notable bar in quality, it did little to prepare me for the choice barrels that followed: Motor Supply Co.’s rickhouse D barrel, Beast Masters’ “That Old Kentucky Chew” (rickhouse B), Barrels & Brews’ “Haters Gonna Hate” (rickhouse H), and last but certainly not least, the distillery exclusive Master Distiller Selection (rickhouse D). What made the 2018 Master Distiller Selection so special? Well, it’s not often that you find a single barrel selected by four esteemed Kentucky master distillers: Jimmy and Eddie Russell, Fred Noe of Jim Beam, and Chris Morris of Woodford Reserve. Talk about a lineup! It was such a unique event I had no choice but to take a few “creative liberties” with its backstory. 😉 As for the bourbon itself … rich and robust Tyrone-aged excellence. A near-perfect combination of ideal maturity, intense complexity, and rare balance. Well done, gentlemen. Those Jewish Whisky boys have done it again! There was a time I thought that Single Cask Nation and Whisky Jewbilee bottlings had a slight advantage over other Wild Turkey selections simply because the JWC bottles at barrel proof. While I can’t dismiss that argument altogether, I can say that for me personally, I’ve come to realize that the true mojo comes from Joshua Hatton and Jason Johnstone-Yellin. Two Single Cask Nation bottles stood well above the single-barrel crowd this year (a tough year to stand out in, I might add). Barrel #1075 is a funky and fruity rickhouse K flavor bomb. Originally marked as “rejected” by the distillery, Joshua & Jason couldn’t resist tasting a misfit barrel (and I’m so glad they took that chance). The result was in many ways a throwback to the old-school “Wild Turkey Funk.” An amazingly unique and contemplative whiskey. But just when you thought the JWC duo had their shining “chance-of-a-lifetime” barrel moment, they had a helluva surprise waiting for us … barrel #16-313. Single Cask Nation barrel #16-313 is a bourbon tour de force. The label states “a bourbon for Scotch drinkers,” but don’t let that statement fool you. This Wild Turkey barrel tastes nothing like distilled malted barley; that said, it has every bit of the layered complexity and timeless charm of a highly cherished bottle of vintage Scotch whisky. It has dark chocolate. It has pipe tobacco. It has molasses, horehound candy, sweet smoke, and countless thought-provoking notes that ultimately leave an indelible impression bordering whiskey perfection. It’s the Best Single Barrel of 2018 and the Jewish Whisky Company (and Wild Turkey) should be proud. We all knew it was coming, but no one (not even a Turkey fanatic like me) was prepared for how incredibly delicious Wild Turkey Master’s Keep Revival would be. Talk about a complex whiskey! The thing I love most about Revival is that it’s so “outside of the box,” yet at the same time it ironically isn’t. Scratching your head? Think of it like this – while 20-year-old Spanish Oloroso Sherry casks undoubtedly added their “Old-World” signature touch to the 12-15 year KSBW, Revival stayed well within the beloved classic Wild Turkey profile. We have Master Distiller Eddie Russell and his hard-working team to thank for that. From day one Revival was Eddie’s baby, and boy did he raise it well. There’s plenty of brands finishing whiskeys, primarily rye, in ex-wine casks. From craft distilleries to major producers, some do it better than others, yet few do it well with bourbon. What Eddie accomplished with Revival is a masterwork. An impeccable example of dedication and craftsmanship that will be revered for many years to come. It’s my favorite whiskey of 2018 and it deserves every bit of praise a whiskey enthusiast can give. Take a bow, Eddie. A most sincere thanks to everyone that helped make 2018 a fantastic year for Wild Turkey. From the Russell family and the entire distillery crew in Tyrone, to the kind folks at Campari USA, I thank you. From Joshua and Jason of the Jewish Whisky Company, to Fred Noe and Chris Morris, y’all picked some stellar barrels and I thank you. And finally, to all my bourbon family & friends, patrons, supporters, followers, and readers, I wholeheartedly thank you. 2018 has been wonderful and I can’t say thank you enough. Here’s to 2019 … Cheers! It really was a great year for Wild Turkey! I just picked up a second Revival, which I’ll keep a while before drinking. And for some reason, at least to me, the 101 bourbon I just picked up is the best I’ve ever had. I’ve never had the 8 year age statement. It has this added ‘leathery’ quality I never noticed much before but love! I need to grab another Revival myself. I had a sealed second … not sealed anymore. 🙂 And yes, some of the recent 101 batches have been excellent. You’re not really missing anything with modern export 101/8. The dusty stuff, however, is just different altogether. Not necessarily better. Cheers Jon! Great Job David… I think it is plain hard to beat the value the readily available OTS WT 101 Bourbon brings to the table. They should also get the award for most improved as just a short time back this was pretty mediocre whiskey and in some cases just plain poor whiskey. I the days when folks are paying crazy money for pretty average whiskey why not just settle in with a case or two of 101 for less than folks are paying for the latest and greatest bottle which is most likely just sourced MGP…. My thoughts exactly, Reid. And thank you. There’s wisdom here. Glad you put the regular 101 on the list, 2018 is solid, maybe the best in over 20 years. Why anyone chases stuff like Weller Special Reserve when you can buy this perplexes me. Thanks for sharing such great info with us. Your site is one of my favorites! I have a couple of the 2018 101’s ready to do a tasting LL/GG and LL/GH! Thanks Jordan. I appreciate the feedback. Please let me know how your tasting goes. Cheers!